Knowing how to cook lentils can save you money when planning meals as they are inexpensive, protein packed, full of fiber, and tasty. 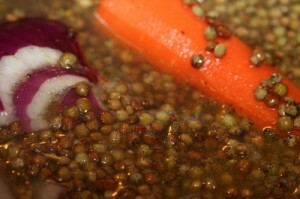 Lentils are one of the easier legumes to cook as they do not need to be soaked first. Lentils should be rinsed with water and spread on paper towels to be sorted through. You want to remove any dirt clods or stem pieces. The easiest way to cook lentils is to place the cleaned lentils in a large pot, cover them with water and bring them to a boil. Allow them to boil for 15-20 minutes. Check them at 15 minutes to be sure they are not getting mushy. Once boiled and cooked they are ready to eat. Saute the onion and garlic in the oil in a large pot. Add the lentils and broth, you may need to add extra water to fully cover the lentils. Cover the pot and allow it to simmer for about an hour–checking to be sure the lentils don’t become too mushy. This soup is very hearty and goes great with crusty bread and dark red wine on a cold winter’s night. You may also enjoy it topped with a dollop of plain yogurt mixed with some minced garlic.